At end of ramp, turn left onto W Society Rd. At stop sign, veer left. Turn left on to the parking log roadway between the Community Center and Lillie B. Haynes School. 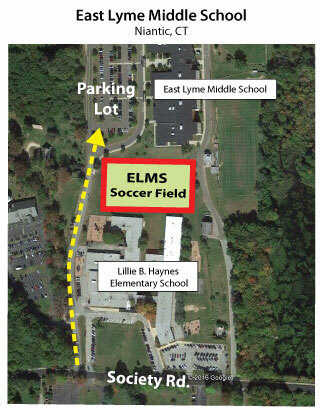 The East Lyme Middle School soccer field is located directly behind Lillie B. Haynes School. Turn right onto Rt 161 at end of ramp. At third stoplight, turn right onto Society Rd. Turn right onto the parking lot roadway between the Community Center and Lillie B. Haynes School. After driving under the I-95 overpass, follow Rt. 161 South to the third stoplight, turn right onto Society Rd. Turn right on to the parking lot roadway between the Community Center and Lillie B. Haynes School.